Hamada of Japan offers traditional Japanese cuisine at its three locations in Las Vegas. 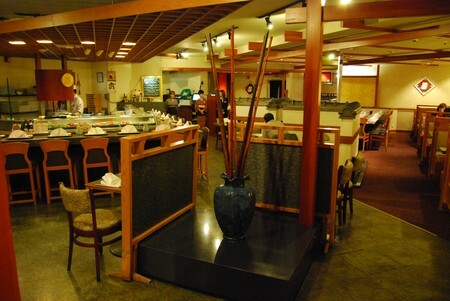 The extensive menu includes sushi, teppan-grilled meats, perfect Kobe beef, and even unusual dishes like Ika Natto. Hamada features native kimono-clad servers, traditional music played on a shamisen, sushi chefs with lightning-fast hands, and teppan chefs with lightning-fast knives. Whether trying sushi for the first time, or expanding horizons with donburi, you’ll find traditional Japanese dining at Hamada of Japan. When dining abroad, the best rule of thumb is to eat where the locals are, even if that means surmounting a language barrier. For Japanese cuisine in Las Vegas, a different rule applies: eat where the Japanese tourists and expats eat. This, of course, means a trip to Hamada of Japan. Nina and I picked a cold winter night to try Hamada. The restaurant boasts three Las Vegas locations (plus one at LAX airport, which I have mentally filed for the next time we fly to the Far East). We ate at the Hamada in the Flamingo Casino. The other Hamada of Japans are located three blocks east on Flamingo Road, and at the Rio. Nori Kawagoe is the Executive Chef for all three restaurants, so patrons can expect consistency. (Should securing a reservation prove difficult, try another location.) Chef Nori is also a very busy person, if the size of the menu is any indication. Hamada boasts a seven-page menu. The dining room is bright and spacious. Chef Nori wants guests to be able to see the high quality of the ingredients. Subdued shamisen music plays in the background. There is also the obligatory suit of samurai armor on display. I believe there is a law somewhere requiring the use of armor and shoji screens in Japanese restaurants. Guests will find that the restaurant is comfortable. A full meal can be a multi-hour experience. I am rather tall. So I'm glad to report this is one of only a handful of restaurants I've been to in Las Vegas where I didn't feel cramped and could stretch my legs. If you speak Japanese (I don't, other than a few polite phrases), you can practice with the staff. Everyone at the restaurant is a native of Japan. Often, patrons will hear more Japanese spoken than English as the tourists and expatriate file in for a taste of home. Nina and I relaxed and settled in to read the expansive menu. We ordered two Sapporos because beer pairs better with sashimi, and also because there is no wine list at this restaurant. Make no mistake, we came for sushi. Teppan is fun. The steaks are always good at a Japanese restaurant. But we came for the seafood. We're also picky about our fish, having lived in the Caribbean for so long. We are used to eating tuna that was caught that afternoon. I started with a simple bowl of miso. Just like Nina is picky about onion soup, I'm picky about miso. Roughly half of the time, the soup is so salty I can't finish it. This, however, was miso the way it was meant to be. The dashi was well seasoned but not overly salty. The soup was subtle, with scallion flavor dominating, giving way to bonito and nori flavors. The tofu was firm yet silky. This was a great miso. Nina started with an Ika Natto. This is one of those dishes you won't find at a typical Japanese restaurant. Natto soybeans are fermented to the consistency of homemade peanut butter. This has a very strong flavor, much like a soft cheese. It is piped onto strips of finely-diced raw squid and served with a soy sauce dressing and wasabi. Next, we went "baka" on the sushi and sashimi menu. Tuna was a must. Many aficionados judge a sushi bar by the Masago (egg) sushi. But we judge by the quality of the tuna. This tuna was as red as a bell pepper and just as shiny. The sweet fish literally melted in our mouths. We ordered seconds. The salmon was buttery and firm. As much as I agree with aquaculture and farm-raised anything, wild-caught salmon simply tastes better. And when the fish has to stand up on its own, without even the benefit of heat, the wild Alaskan salmon makes a big difference. I wanted eel. Nina wanted avocado. So we compromised with a dragon roll—barbecue eel, avocado, crab, and cucumber. All the ingredients were fresh and perfectly prepared. The sauce was tangy, and paired well with the creamy avocado and crisp cucumber. My favorite sushi is the spicy tuna hand roll. This is a cone-shaped concoction of rice and spicy tuna tartare. One thing that hit me was how fresh the nori was. The tartare was zesty. Adding wasabi upped the flavor quotient. The end result was a great piece of sushi. The albacore was our favorite of this course. This light-colored tuna had an aroma of sea foam, and was light as a cloud. One bite of this and you'll never want to so much as look at canned tuna again. While Hamada serves every cut of beef expected from a Japanese steakhouse (including imported Kobe beef at nearly $20 per ounce), we opted for more traditional Japanese dishes. Nina ordered the Tempura Udon. This traditional soup was filled with soft-as-tofu udon noodles that were at least a quarter-inch thick. A medley of tempura vegetables and two large tempura shrimp brought some heft to the dish. The tempura sweet potato was particularly good. Nina said this was a perfect choice on a cold day. The broth was light but flavorful, and the tempura and vegetables made this a hearty meal. As mentioned, Nina and I did not try anything from the terpane menu. But we could see the terpane dining room from our table, and the area was full of people having fun eating grilled meats with rice. Our meal at Hamada was everything we expected. We wanted the traditional and that is exactly what we got. From the opening “konichi-wa” to the last morsel of donburi, Hamada gave us an evening in Japan at a fraction of the price. It’s easy to see why this restaurant is popular with both the locals and the Japanese expat community. Golden crusted, fried tofu served with a flavorful dipping sauce. Lightly salted, boiled soybean pods. Fried tender Japanese calamari served with cocktail sauce. Ground pork and vegetables, wrapped in wonton skin and pan fried, served with dipping sauce. Chilled tofu garnished with chopped green onion and flavorful bonito fish flakes. Natto soybeans with thinly sliced squid, served with wasabi & soy sauce blended dressing. Grated Japanese daikon radish, topped with salmon caviar. Tofu and seaweed in a soybean curd broth. Cucumber, lettuce and "mekabu" seaweed with sweet vinegar dressing. Grated Japanese daikon radish topped with dried young sardines. Try with soy sauce. Shrimp and assorted vegetables, lightly batter-fried and served with dipping sauce. Lightly fried soft shell crab dressed with yuzu-ponzu sauce. Cucumber, tender octopus, surf clam salad with sweet & sour vinaigrette. Assortment of sushi: tuna, white fish, shrimp and salmon. Julienned mountain yam with fresh quail egg & seaweed flakes. Fresh greens, julienne Japanese daikon radish, enoki mushroom and kaiware sprouts, topped with Hamada's ginger dressing. A refreshing assortment of fresh tuna, shrimp, salmon, squid, whitefish, carrot, daikon radish, cucumber, seaweed, lettuce and egg. Enjoy with Hamada's special ginger dressing. Grilled tender range chicken topped with Hamada's teriyaki sauce. Grilled New York steak topped with Hamada's teriyaki sauce. Broiled fresh salmon filet topped with Hamada's teriyaki sauce. Tender pork cutlets, lightly breaded & fried, served with shredded cabbage & tonkatsu sauce. Shrimp & assortment of vegetables lightly battered & fried, served with tempura dipping sauce. Assortment of fresh tuna, white fish, salmon, squid, surf clam, shimp, egg, salmon caviar & tuna roll. Assortment of fresh raw tuna, white fish, salmon, squid, surf clam, octopus & yellowtail. 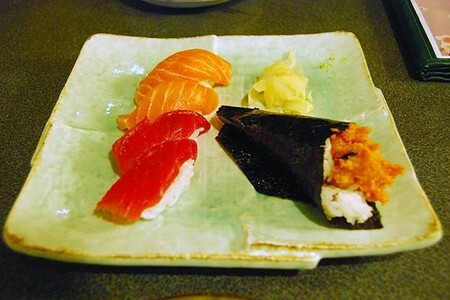 Delightful Medley of Hamada's popular sushi & sashimi favorites, served with wakame/cucumber sunomono and miso soup. Sashimi selection includes: Tuna, Salmon, Albacore. Sushi selection includes: Spicy Tunda Roll, Crab Roll, California Roll. Udon or Soba noodles in a hot soy sauce based broth with deep-fried tofu. Flavorful egg noodles with vegetables, sliced pork and fish cake, in a soy sauce-based broth. Buckwheat soba noodles, with a side of shrimp & vegetable tempura, served chilled with a light dipping sauce. Buckwheat soba noodles, with grated Japanese mountain yam, served chilled with a light flavorful dipping sauce. Udon or soba noodles in a hot swoy sauce-based broth, served and fresh raw egg. Buckwheat soba noodles with nori seaweed, served chilled with a light dipping sauce. Udon or soba noodles in a hot soy sauce-based broth with shrimp & vegetable tempura. Pork cutlet, egg and julienned vegetables over a bowl of steamed rice with a sweet soy sauce. Chicken, egg and julienned vegetables served over a bowl of steamed rice with a sweet soy sauce. Deep-fried shrimp & vegetable tempura served over a bowl of steamed rice with a sweet soy sauce. Steamed eel dipped in Hamada's kabayaki sauce perfectly broiled served over steamed rice with extra sauce sprinkled with sansbo powder. ($65 for two) Beef Shish-ka-bob, chicken teriyaki, tempura shrimp & vegetable, california roll, sunomona cucumber salad and fruits, served in a boat shaped platter. Perfect for 2 or more. Additional order, $32.50 per person. Appetizer, sunomona cucumber salar, tempura, sashimi, vegetables cooked in sweet soy sauce, choice of New York steak or salmon teriyaki, dessert. Fresh raw tuna, white fish, squid, salmon, surf clam, octopus, yellowtail, halibut, raw shrimp. Fresh raw tuna, fatty tuna, white fish, squid, salmon, octopus, yellowtail, raw shrimp.